Apple already shipping out iPads to UK customers? With less than a week until the iPad's international launch, some UK customers may end up seeing their devices at their doorsteps a bit earlier than expected. UK based readers of MacDailyNews have provided some insights to the reality that some can expect to see their iPads earlier after a shipment report was sent out to some people. 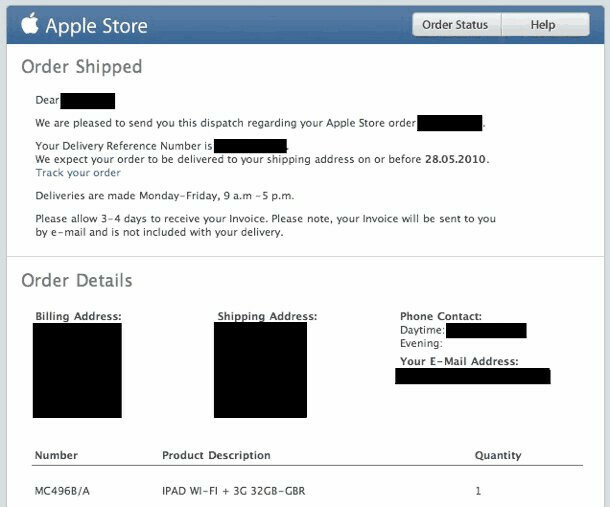 As we you can clearly see in the accompanying shipment report, Apple anticipates delivery on or before the date of May 28th. In addition, these customers can be up-to-date with their shipment's whereabouts as the tracking information is also provided. So it would seem that there will surely be some big smiles on the faces of these UK customers that receive their iPads earlier than the official international May 28th launch.